Dan Dainton has a particular love of rye. It's in most of his beers somewhere and, now, in the title of two of them too. The Samurye is his first lager and, like his first commercially released ale, the Red Eye Rye, places his favourite (non hop) ingredient front and centre. Rye isn't alone in making up a left of centre grain bill in this lager either – white rice makes an appearance to keep things sprightly on the palate too. Samurye is to slot in from the off as part of the newly reworked and eye-catchingly rebranded Dainton Family Brewery core range and, like pretty much everything that has come from the brewery, nudges the envelope of its style. 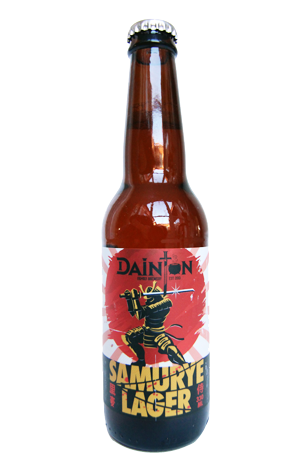 So, while the copper-coloured drop is a tight package designed for broad appeal, it still launches with some tropical, lime hop aromas and has some fruity, resinous hop flavours alongside a touch of rye spice and paler malt characters before a dry finish brings things to a close like a swish of the rapier blade branded by the warrior on its label.